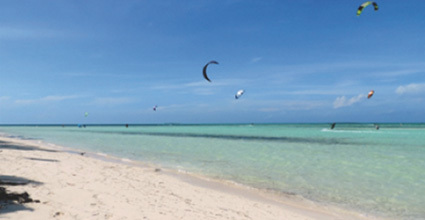 Our Kite Surf Station is located directly on the Beach of your Hotel at Sol Cayo Guillermos. Roland and his Team is providing excellent service and a large variety of equipment from North. For your safety a boat or jetski is ready for emergencies at all times. November to April.Dr. Sachweh in munich has created a wind appraisal of Cayo Guillermo for us. The wind direction is side-on-shore from the right and blows 80% of the season with 11-15 knts or more. In Cayo Guillermo you will find a large shallow water area right next to a up to 1.5 meter wave – the perfect spot for all levels. Ask our on-site team if you are interested in booking a 8km downwinder featuring knee to hip deep water all the way down.Hotel Sol Guillermo offers perfect accommodations for kite surfers with only a few feet from “bed to board”. There is plenty of space in either the hotel yard or on the beach for you to set up. Comprehensive cover for rental equipment, liability up 2 mio. year accident protection. completely 39 €.